Our Joey loved to play. I’ve said before that she spent half of her life on a playground–in our backyard, at parks, and of course, at school. Her dad would push her on the swings until his arms felt like they’d fall off. As National Playground Safety Week drew to a close last week, I felt a little guilty for not posting about the importance of playground play–not too guilty though–we were busy playing outside! Nevertheless, with spring taking hold across the country, kids big and small are headed outside to play. And thankfully, today’s playgrounds are nothing like the ones we grew up on, with hot metal slides, splintery wooden structures, and asphalt pads underneath (what the heck were our parents thinking?!?) 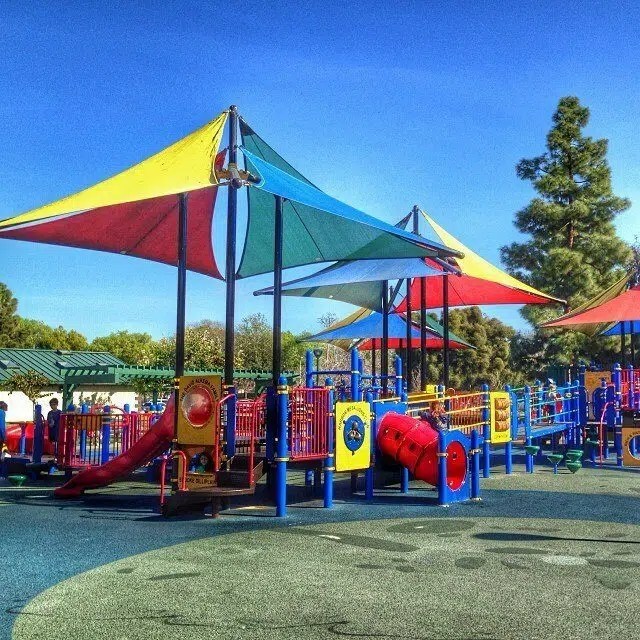 Here are few tips we’ve gathered to help keep your little charges safe on today’s playgrounds! Supervision: Seems like an obvious one, but all too often, adults in charge at the playground can be too wrapped up in conversation or smart phones to provide help or direction to kids at play (yep…guilty here too). Of course, scraped knees and bruised feelings will happen anyway but, adult attention to safety and injury allows kids to get the most and best out of their playtime! Age-Appropriate: It’s a good practice to match playground equipment with the developmental levels and needs of the child. Most playgrounds post age guidelines for visitors, and more and more are designed to be inclusive of special needs playmates, like our Joey. Fall Structure: Gravity is a fact of life, and sometimes a painful one! One way to reduce the risk of injuries from falls is to ensure that playgrounds have appropriate cushioning and surfacing, like rubber or sand. Our backyard playground was cushioned with rubber chips (which we also recommend for “snow” angels and “ice cream” stands). Equipment: It is important for playgrounds to be routinely maintained and for visitors to report concerns to the owners, municipalities, or schools that maintain them. The best playgrounds get LOTS of use so, the more eyes on the safety of the equipment, the better and safer we all are. What actions can you take to address the S.A.F.E. factors? When it comes to supervision, it’s not just about being on-site. According to NPPS, adults should be constantly moving around the playground, with eyes open for faulty equipment, broken glass, and other potential safety hazards. And if your playground looks like it needs some attention, speak up! The National Parks and Recreation Association recommends that children ages 2 to 5 play separately from children ages 5 to 12 while on the playground. And according to NPPS, if you need to lift your child onto a particular play element, it’s likely not suited for that child’s developmental level (or YOUR back!). Wishing you and yours lots of happy, healthy fun at the playground! Written by Michele Gay, Co-Founder and Executive Director, Safe and Sound: A Sandy Hook Initiative.